Isle of Wight Fell Series. Bear left at the start onto North Walk. Run to the end of North Walk. After the roundabout cross to the Left hand side of the main Esplanade road when traffic allows. Turn hard left after Ryde Castle onto Dover St. then East St. then the Strand. Run the full length of the Strand. Run along Park Road, over the railway bridge & up to Dover Park school, taking the 2nd right into Dover Street. 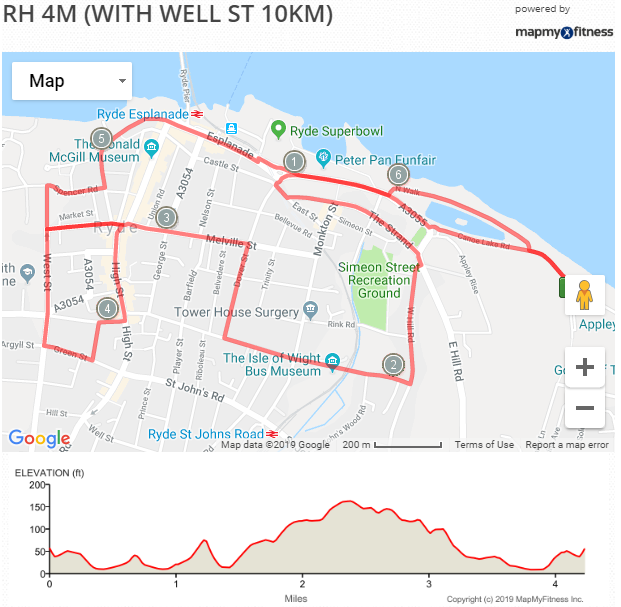 Take the 2nd left into Melville St, keep going past the top of Union St (2 mile) and straight across past the town hall, then left up West St.
At the top of West St go straight across at the traffic lights, then next left into Green St, left into Station St and right into Newport St. Turn right on Spencer Rd, turning left into St. Thomas’s St.
Run down St. Thomas’s St. cross to the left when safe, then keeping left run around the roundabout by the rail station. Now run along the seaward side of the Esplanade, finishing outside the clubhouse. Many thanks to everyone who ran and helped at the West Wight 3 Hills today, hope you enjoyed the new course over Headon Warren. Many thanks to WightLink for providing the generous discount for mainland runners. Thanks to everyone who ran and helped at the Newport to Ryde today - it certainly was a hot one! Many thanks to WightLink for sponsoring the mainland runner travel!